Edgekeeper knives by Sabatier have sharpening rods built right into each storage sheath, so they automatically sharpen the knife blade every time you remove or replace the knife into the storage sheath! the Self-Sharpening mechanism, which is highlighted in Red at the opening of the protective sleeve, is aligned to sharpen the blade at the correct angle, taking away the guesswork and helping to keep knives sharp for optimal performance. This 7" Santoku knife is expertly crafted from superior quality, high-carbon stainless steel to deliver outstanding performance no matter what the cutting task at hand. The stainless steel handle is perfectly weighted and balanced for optimal control. Hand-wash with warm water and a mild detergent; rinse and dry immediately. EDGEKEEPER TECHNOLOGY: Sabatier EdgeKeeper Knives feature a sheath with innovated technology that is designed to automatically sharpen the blade with each use. Never worry about a dull blade before use. SELF SHARPENING: The EdgeKeeper protective sheath contains a built-in mechanism that hones the blade before and after each use, maintaining a blade's razor-sharp edge. The built in self-sharpening technology guarantees a sharp blade for each use. HIGH-QUALITY BLADE: The blade is made from high-carbon steel that lends strength, sharpness, and durability. 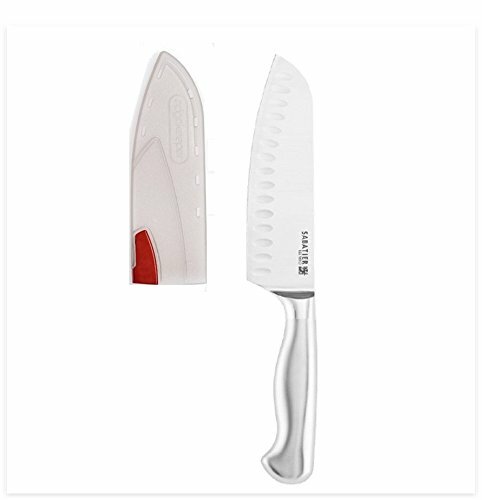 This knife ensures ideal cutting angle for sharpness and durability. MUTLI PURPOSE KNIFE: This Santoku knife combines the best features of a chef's knife and a cleaver, with a wide, heavy blade that is ideal for chopping, slicing, and dicing. COMFORT GRIP: This knife offers an ergonomically designed handle for exceptional comfort and durability while using. Never worry about discomfort when using.